As 2013 was coming to a close, the Lakota Federal Credit Union’s Board of Directors approved an increase in their secured loan limit from $5,000 to $25,000 in a strategic move to promote asset-building opportunities for its 1,166 members. While its average loan size had been hovering at just under $4,000, the Lakota Federal Credit Union is already seeing the impact resulting from this change. Beau LeBeaux recently financed his second vehicle, a pick-up truck, so that he could have reliable transportation to and from work during the winter months. 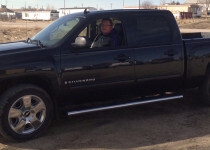 Beau LeBeaux, member of the Lakota Federal Credit Union, purchased his pick-up truck by utilizing a secured loan. “I really just went in to get direct deposit so I wouldn’t have to wait for my checks. I couldn’t believe it when I qualified for a vehicle loan,” says LeBeaux, whose credit score was one point over the requirement. While unreliable transportation is often times a barrier to steady employment for many residents of the Pine Ridge Reservation, this financing opportunity meant the difference between keeping a job or becoming unemployed for LeBeaux. LeBeaux now frequents the Lakota Federal Credit Union the 1st and the 15th of every month to make his loan payments, pay his utility bills, and utilize various other services. However, he had not always been a proponent of banking and didn’t even have a bank account when he first came to the credit union. His situation isn’t unique as 50% of households on the Pine Ridge Reservation are estimated to be either underbanked or unbanked. “I had some bad experiences with banks in the past. I never understood all of the fees they were charging me, so I just stopped using them,” says LeBeaux. His experience at Lakota Federal Credit Union has been different, “They take the time to explain things to me. I have a relationship with them, and I’ll do everything to keep that relationship in good standing,” he adds. The loan increase announcement came shortly after the Lakota Federal Credit Union celebrated its first anniversary in November 2013. At 2013 year-end the credit union had approved approximately 50 loans totaling over $650,000 and had $1.7 million in assets.